A Gorgeous Parfait made of heavenly dark chocolate ganache layered with Coconut , Chocolate rich Brownies and Fresh Raspberries. There are times when I’m not always in a good mood.There is nothing better than a dose of chocolate that brings me back to life. One of my most loved recipe which includes both my favorite forms of chocolate , brownies and chocolate ganache , and one more additional ingredient in it is Coconut. As it is the month of Ramadan , time is of essence and favorably, preparing this dessert is not time consuming at all. As appealing as it looks , it tastes delicious and can be the perfect sweet dish served on your Iftaar spread. 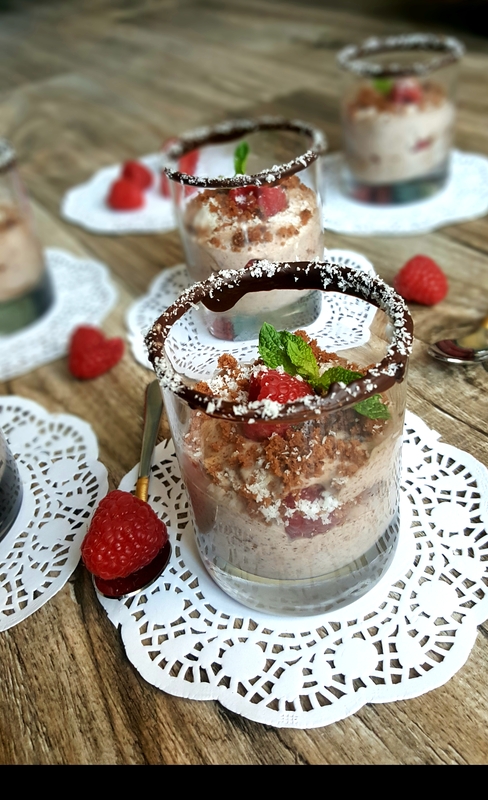 There are certain heavenly creations, and if the angels were to make a list of the heavenly foods, this chocolate mousse with beautiful Halo around it would surely find a place in that list. To rim : melt chocolate in microware for 20 seconds, until melted . Next to pour this melted chocolate in one plate and some sweetened coconut flakes in other plate. Dip glass rim side down in the chocolate and then followed by the coconut .Let it chill in refrigerator until harden and ready to assemble. For mousse : Melt chopped chocolate in a medium heat-proof bowl and set aside. Immediately pour cream over chocolate and let sit without stirring for 1 minute. Then, whisk mixture gently until completely melted and smooth. Allow to cool slightly before using. In a medium bowl using an electric mixer fitted with the whisk attachment, whisk whipping cream until it holds its shape. Using a spatula, gently fold half of the whipped cream into the prepared chocolate mixture and coconut flakes, then fold in the other half. Take the chilled glasses out of fridge and spoon 1/4 of the mousse in each glass. 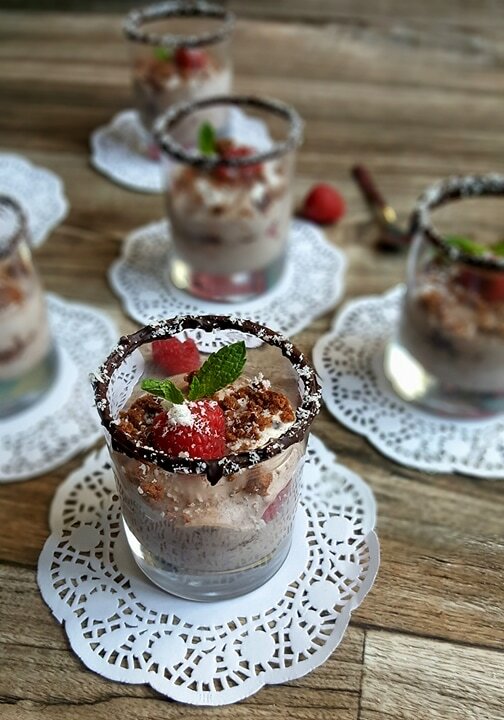 Top each layer of mousse with raspberries , Brownie crumbs and Sprinkle some coconut on it. Finish by filling remaining mousse and finally the remaining brownie crumbs and raspberries. To summarize, 9 out of 10 people like chocolate and the 10th one always lies.Hope you enjoy the recipe and don’t deny your love for chocolate. Stay Connected with my daily food updates on Instagram and Facebook.